Place garlic, almonds, basil and arugula in the food processor and pulse until finely chopped. 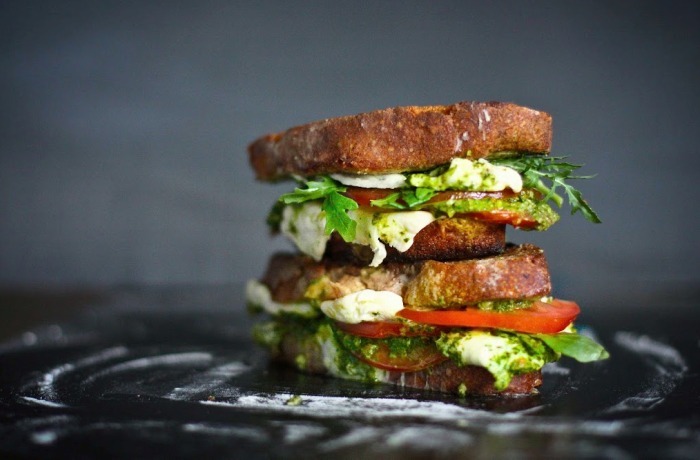 Layer fresh mozzarella, tomatoes and arugula pesto between two slices of bread. Heat 1 T butter and 1 T olive oil in a heavy bottom oven proof skillet. Lightly brown each side place in the hot oven. Bake until cheese is melty, about 10 minutes.